My Junkin' Friend Jodi gave me this pig mail organizer. I first pried the pigs off of the backboard. Since there was glue besides the staples, I sanded the glue/wood splinter residue off. This was the hardest part of my whole makeover, but I did get it smooth. Next I painted the mail organizer backboard with Annie Sloan Chalk Paint in "Cream". Of course I distressed it with sandpaper and waxed the piece with clear wax. 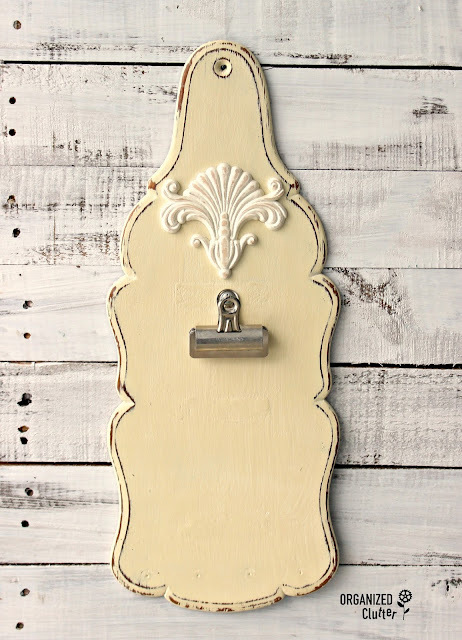 I added a wood applique from D Lawless Hardware painted with Annie Sloan Chalk Paint in "Old White". A Bulldog clip was screwed into the organizer back, and the tip that came through on the back was sawed off with a hacksaw. Here's the finished photo display clipboard. 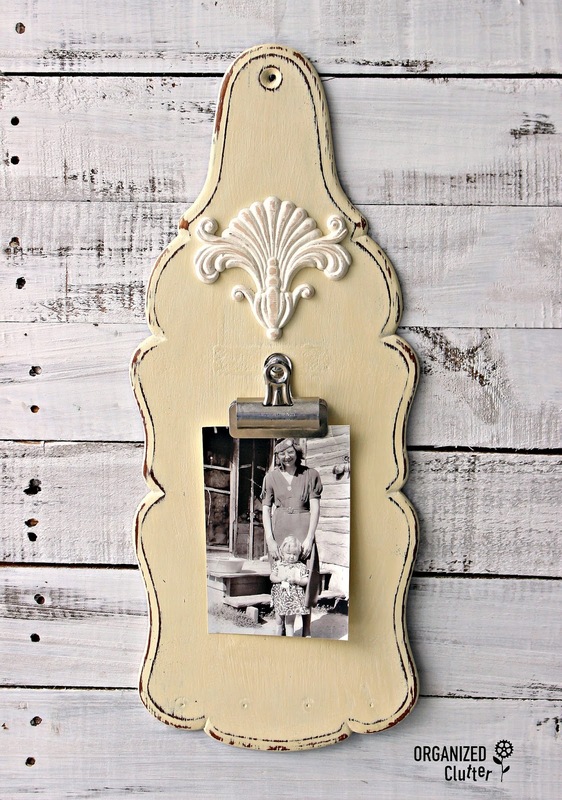 I love photo display alternatives to picture frames! So much more fun! That turned out great. What did you do with the pigs? Could you paint them and attach a magnet on the back? They would look cute on the fridge. Super clever Carlene. I love your ideas! What a great gift that would make! LOL, I do hope that the pigs haven't gone away...they are so cute! Very nice way to "hang a photo". Wow! That was quite a transformation. I'd never have seen that one coming! Your project turned out really cute. Great thinking. Very sweet. But I loved the piggies. Will you do something with them too?